I bought the New English Library (Mentor) paperback edition of A Hero of Our Time, translated by Philip Longworth, many years ago for 12 pence (I know this because the price has been scrawled on the front cover in black ballpoint), but only got round to reading it this summer. This translation was first published in 1962, and was issued by Mentor in 1975. The pages have yellowed and the cover is battered, but none of this detracts from the astonishing quality of the novel. Born into a noble Moscow family Mikhail developed a love of the Caucasus region from the age of ten, when he was taken there by his grandmother for the sake of his health. 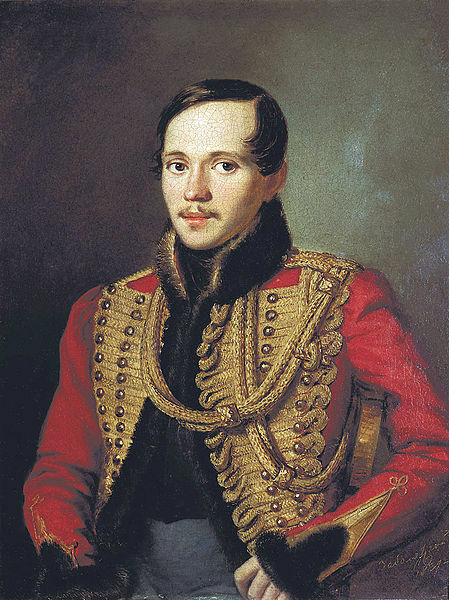 He entered military service after an abortive spell at the University of Moscow. A Hero was published in 1840; that same year he was banished to the Caucasus (for the second time – a punishment he surely relished) after duelling with the son of the French Ambassador. A year later he fought another duel with a fellow officer and was killed; he was only 27. I have a spirit that has been spoiled by the world, a disturbed imagination, and a heart that can’t be satisfied; everything means so little to me; I get used to sorrow as easily as I do to pleasure, and from day to day my life becomes emptier. Made restless and deeply saddened, despite his pose of indifference, by this episode with Bela, he resolves to travel – to nowhere specific; ‘perhaps I shall die on the road somewhere’; he appears to have lost his will to live. Maxim upbraids him for his nihilism and hints that Pechorin has caught the fashionable society malaise ‘disillusionment’; Pechorin simply jokes that it must have been the English who invented this ‘fashion of tedium’ – Maxim notes that some believed Byron was ‘nothing more than a drunkard’. Pechorin is a compellingly conflicted, arrogant, melancholy character, and A Hero is one the earliest ‘superfluous man’ novels; it foreshadowed the existential, angst-ridden anti-heroes of the type that became popular from the 1940s with Sartre, Camus and then, in the USA, Kerouac and the Beats. In the second story, ‘Maxim Maximich’, Pechorin reappears, and is described as evincing a sense of ‘nervous weakness’, with a ‘childlike’ smile and feminine demeanour. His eyes suggest either an ‘evil temper’ or ‘constant melancholy’, and his glance is ‘indifferently calm’. Maxim, who has awaited this meeting with expectant excitement, is brushed aside insouciantly by Pechorin, who says he can’t stop – he’s off to Persia, once again motivated solely by boredom. Maxim is almost as heartbroken as the betrayed Bela; he sadly describes Pechorin as ‘a lightminded fellow’ on whom ‘one couldn’t rely’. 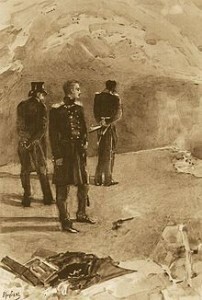 He bitterly hands Pechorin’s journal, lightly given over to his charge by its author, to the young narrator, and it forms the basis of the remaining three stories. One now sees from where the excellent literary blog ‘Pechorin’s Journal’ derived its name! The narrator, in an aside, insists on the ‘innocence’ and heroism of Pechorin, who, he says, ‘brought his own weaknesses and vices so mercilessly to light’. ‘Taman’ is the third story. Here Pechorin relates how he is robbed and nearly murdered by a blind boy (whom he suspects is ‘not as blind as he appeared’) and a bewitching young Caucasian girl, both smugglers. ‘Princess Mary’ is the longest story, almost 100 pages. In this novella Pechorin ruthlessly seduces the eponymous heroine, while continuing an affair with a former, infatuated lover, Vera, motivated like the libertines in Laclos’ Dangerous Liaisons largely by a desire to besmirch a haughty, pure woman who initially resists him, but also to spite his foppish friend Grushnitski, whose dandyish ennui piques him because he recognises there a parody of himself. In a plot of exciting suspense, treachery and deviousness Pechorin kills his rival in a malicious duel. ‘The Fatalist’ is a strange coda to the collection. Set at a time either shortly before or after the events in ‘Bela’, a crazed gambler bets on the date of his own death. Having initially appeared to defy fate by surviving a bout of Russian roulette, he succumbs to a random act of insane violence. Pechorin appears towards the end and risks his life to apprehend the assassin. Why is this? – why is it that I have never really set much value on anything?…I must admit that I do not like women of character really: but that is their worry. I feel I have that insatiable hunger which will devour everything which crosses its path. I see the joys and sufferings of others only in relation to myself, I see them as food to sustain my spiritual powers. ‘Can it be’, he reflects later on, ‘that my only purpose on earth is to destroy the hopes of others?’ His ‘miserable role’ in life, he concludes, has always been that of ‘executioner or betrayer’. He toys with the notion that he has much in common with the Vampire. A Hero of our Time is then that very modern type of novel: the self-analysis of the protagonist’s motives. As William E. Harkins says in his Afterword to this edition, Pechorin is ‘narcissistic and neurotic’, unable to love, addicted to ‘empty posing’, pettily manipulative, ‘opportunistic’ and ‘at times even vindictive’ in his treatment of women and men – the sad figure of Maxim is unforgettable when Pechorin spurns his friendship. He might today be described as sadistic – like so many other flawed, anguished and alienated Romantic heroes, from Schiller’s The Robbers (1781) to Eugene Onegin and the proud, jaded heroes of Byron, and shortly afterwards, the Bronte sisters’ Heathcliff (who also liked to make ‘the worms suffer’) and Rochester, and Dostoevsky’s Stavrogin. Harkins points out that Pechorin is full of contradictions: heroic and neurotic, sensitive to injustice and callously indifferent to the suffering of others, a worshipper of women’s beauty and a narcissistic self-adorer. He is the forerunner of countless existential outsider heroes in later fiction, the nauseated figures disgusted by other people and by their own ennui, filled with indifference and hostile to the matching indifference of an irrational world. This novel prepared the way for the more profound explorations of psychological depths of character portrayed in the masterpieces of Turgenev, Dostoevsky and Tolstoy.